Bartha Contemporary is delighted to announce the forthcoming group exhibition ‘Breaking Geometries’ showcasing works by gallery artists Henrik Eiben, Mike Meiré and Beat Zoderer. 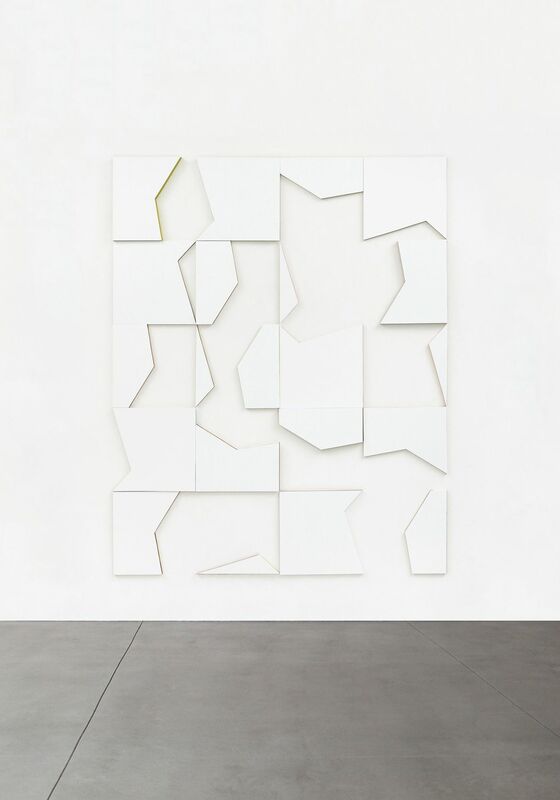 The exhibition explores the motive of geometrical abstraction achieved through the manipulation of everyday objects and materials. The artists share an interest in geometric composition as a point of departure for their artistic productions. Henrik Eiben’s (b. 1975 in Tokyo, lives and works in Hamburg, Germany) works are characterised by what at first appear to be perfect geometric assemblages. 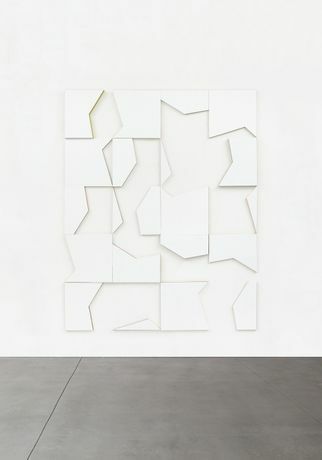 ‘Condo’ a large scale work made up of multiple elements, reveals an additional characteristic of Eiben’s practice through the use of unorthodox materials. The experience is further elevated through the considered use of colour, subversively altering the appearance of the otherwise monochrome relief. Eiben’s pieces invite the viewer to engage in a closer visual examination, revealing the works playful yet minimal disposition. ‘Grid-Paintings’ by Mike Meiré (b. 1964 in Darmstadt, lives and works in Cologne, Germany) on newsprint illustrate the artist’s preoccupation with abstraction rooted in found-geometry. The painting’s origin is determined by the systems that make up the layout of newspapers which serve as the basis for these works and were originally determined by the text that is now concealed. The artist deletes the printed information and allows the underlying structure to emerge. These works exemplify the inherent abstract geometry that is hidden in plain sight. Beat Zoderer’s (b. 1955 in Zürich, lives and works in Wettingen, Switzerland) works too are defined by an apparently systematic and precise order, which reveals different qualities upon closer inspection. Each piece is made of everyday materials, inviting imperfections and errors. One work displayed in the show, part of a series entitled ‘Ringfaltung’, is made of acrylic paint on curved aluminium. The folded circular form reveals a sequence of primary and secondary colours typical of his works. It’s primary circular shape disguised by four folds. As the exhibition title ‘Breaking Geometries’ indicates, the works by Henrik Eiben, Mike Meiré and Beat Zoderer undermine the often overtly precise nature which is inherent in this genre, resulting in different yet truly engaging works. These artists employ geometry as a means to create objects routed in a shared reality without relying on narrative.